It is time for another Tag You’re it Challenge. 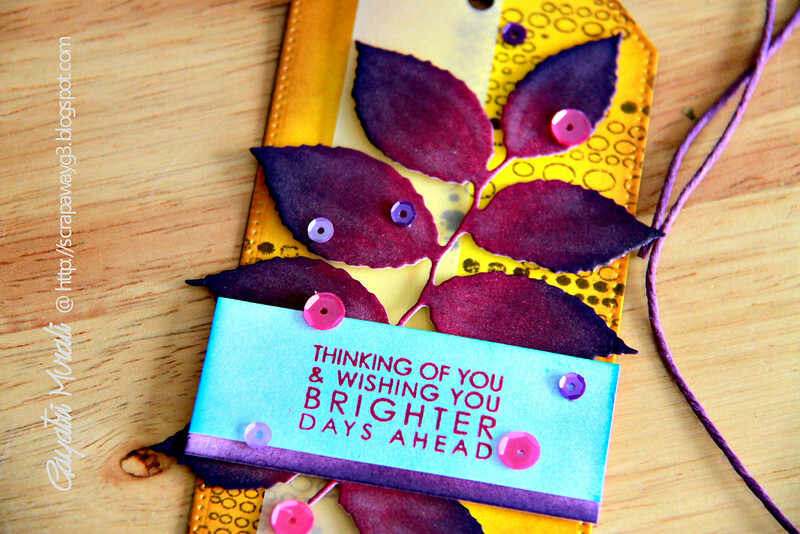 This time we have a gorgeous tag by Jeanne Jachna as inspiration. 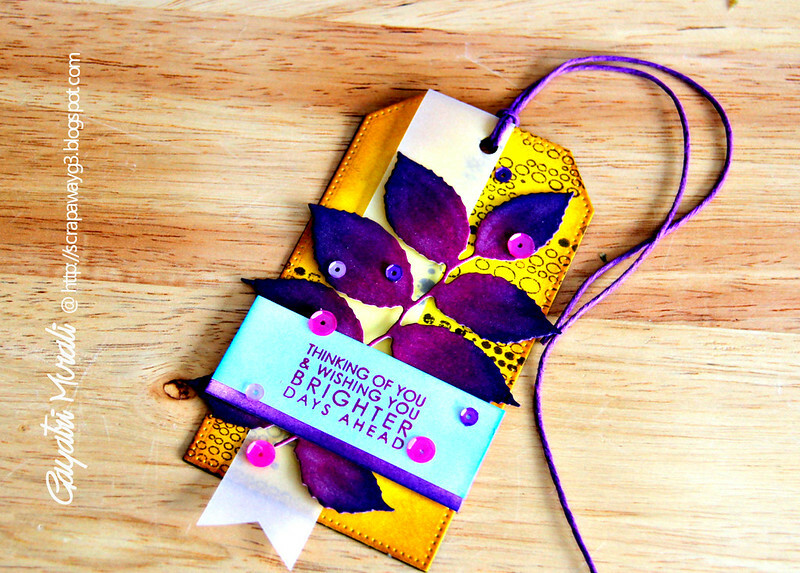 I love the layout of the tag The patterned background, the die cuts and wider sentiment panel. So here is my take on the tag. I have used one of the tag from MFT Stitched Stax Tag die namics as my tag. I sponged Mustard Seed and Wild Honey distress ink then Vintage Photo on the edges. I have used Blips background stamp from Penny Black on my background. I cut a strip of vellum with fish tail end and adhered to the tag. The die cut is also from Penny Black. It is called Lively. I sponged some Dusty Concord and Seedless Preserve distress ink on a white cardstock. Then die cut the Lively die from Penny Black. I then sponged some Chipped Sapphire distress ink on the edges. Once dry, I brushed some clear Wink of Stella shimmer. LOVE the shimmer on the leaves. I adhered this leaf die cut on the tag using foam adhesives. 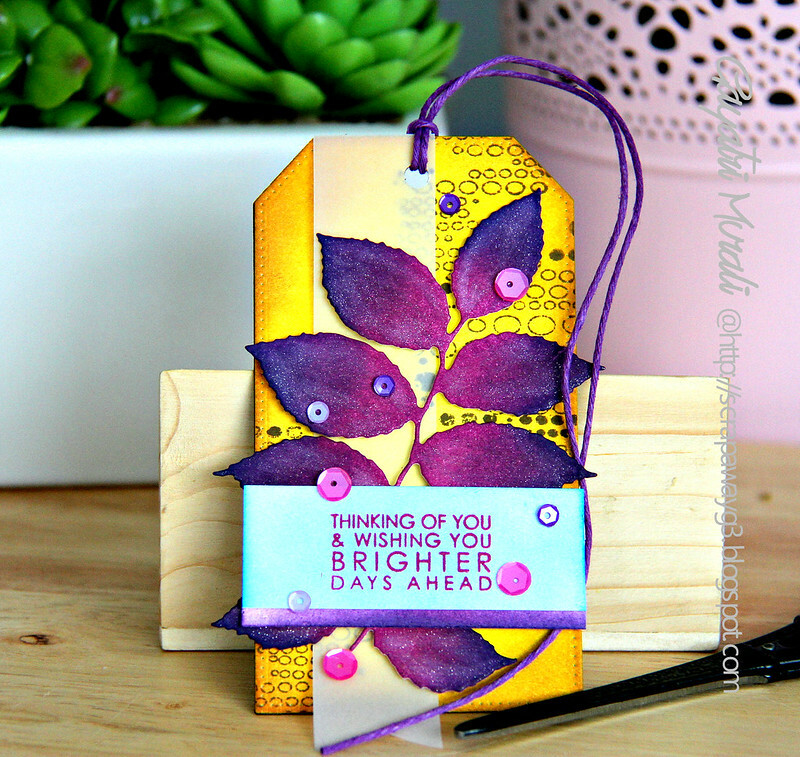 Then stamped the sentiment from Pretty Petal stamp set also from Penny Black on a piece of cardstock sponged with Salty Ocean distress ink. I layered this piece with another piece of cardstock sponged with Dusty Concord distress ink before I adhered on the tag. Finally embellished with some gorgeous Orchid, Pansy Purple and Amethyst sequins from Pretty Pink Posh. Come and play along Tag You’re It Challenge with me! This tagged knocked me over. You are the Queen of Color in my humble opinion. Stunning tag! Gayatri, when I check my emails, I always look for yours first! You have a wonderful sense of style and vibrant colors that send me over the moon! Wow, this is amazing! Your colors on the tag are just beautiful!!! Gayatri, this tag is stunning! I love the shimmer on the rich purple leaves, nice work! This is drop dead gorgeous! Such vibrant color and glimmer are heavenly!